I'm finally joining in with the IWSG. I haven't before now becasue I've been on confidence streak with my writing (I blame it on starting a new story) but that doesn't mean I don't ever have issues, I just hadn't had any issues until this past week. I got to a point in Existence where I was stuck. I knew what the end goal was and I could see the problem clearly, but I didn't know what road to take. I wasn't expecting that to happen. I had plotted the whole thing before hand and I thought the whole MS was going to be smooth sailing. The only problem was I couldn't see was how certian factors would shift my plotting and leave me empty handed at this point in the book. I didn't write that day. Thank goodness my critique group was meeting that night. They haven't been reading Existence (except for the 1st chapter) becasue I'm not at an editing point yet. When it came to my turn there was nothing to discuss; that is, until someone asked if they could help me brain storm. I jumped on the opportunity. I told them everything that happens after that first chapter and we discussed options, and man am I glad we did. Every option I had considered beforehand lead to confusion. Getting the input of my friends was just what I needed to get a shove in the right direction. The next day, I wrote 4,000 words. I have NEVER written that many words in a day. I guess that's why I decided to join this group, becasue I know it won't be last time that I need encouragement to push me through. Who do you go to when you're 'stuck'? Very interesting post. I haven't heard of the Insecure Writer's Support Group. Sounds interesting. Is the blog hop, the list of participants in the IWSG? I know when I get blocked, talking with a critique partner has been so valuable for me! It also helps to step away. Hi, I'm on the blog-hop at the moment, so thought I'd stop by (I tend to visit the blogs with names that intrigue me, rather than them all - far too many). Sometimes I get very insular and overprotective with my WIP, and don't want to share it - it sounds like it worked out for you though. @Patrica - yes, on the 1st Wednesday of every month everyone writes about their insecurities and cheers each other on. It's a lot of fun! Wow! Sounds like a pretty great group:) Glad it helped you! I have joined an online writer's group and a local writer's group and the support is helpful and amazing. Congratulations on your 4,000 words. When I'm stuck, I write anyway. Sometimes the garbage that comes out leads to something great. I talk it out with my hubby. He usually give me suggestions, that I'm like no that's not it. But, then something happens and I'm like AHA! Glad you have your writing group. Oh, and congrats and the 4,000 words. You Rock! Yay for supportive writer friends. I'm not in a formal group, but I have a few partners I can reach out to online for feedback. Glad you joined up with the IWSG. Thank goodness for crit partners! Love that they helped you find your way past the block. that is so awesome! i just got some great inspiration & confidence from my online crit group =) so great to talk to folks who get it! Love the Insecure Writers Group!! 4,000 words--rock on! I think my highest is 3,000! I hate when that happens to me. I usually do something to get out of the house - hoping that inspiration will strike - then I just write through it. If I need to go back and edit later, I can, but at least I'm moving forward. New follower here! LOVE your blog! Thanks for giving a shout out for us insecure people! Wow, wish I had a group like that. I have a few people I talk to, but no one who really knows my plot points. How awesome. 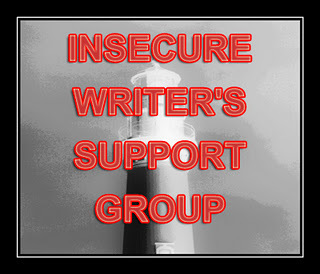 I don't have a critique group, but I do have a writing support group and it helps tremendously. 4000 words. Wow! And I would hang onto those friends...that's awesome! I don't have a set way to get 'unstuck'. It's different every time. Sometimes it takes days of mulling everything over...sometimes I can solve it by just taking a shower or long drive (something about water and cars for me..). Congrats on getting unstuck. I have a story I've been wanting to work on, I can see how it's supposed to go, but not the words to describe the journey. Congrats on getting unstuck. Sometimes we feel like we have to do everything ourselves and are on this journey alone. It's awesome that you relied on your writers group for that extra ounce you needed to push you further into the story. Awesome job, and best of luck! 4k words in a day is awesome, BTW. I get unstuck the way you did, talking it out. I love it when members of the writer's group do this because then I get to brainstorm all the creative stuff without having to do the hard part of going back and writing it out. Sometimes, I just need to step away for a bit and do something totally different and the solution hits me. Often when I'm outside or driving. Gosh...I feel you. I was good to go for the last 150 pages, now...bam. Stuck. Brainstorming with others helps a lot. :) Good luck! My daughters have an uncanny knack for cutting through the convoluted plot I've invented, and finding the right path. Wow! The IWSG is monster-size. And I'm so glad you had people there to help you brainstorm. Sometimes, I make my husband and best friend do that with me and it changes everything. It is great that you have joined us all in the IWSG it's such a good idea isn't it?! once i get my post up, come see! You're lucky to have such a good critique group. There's nothing better for bouncing ideas around. Glad you got unstuck. And, wow, 4k words? That's amazing! Might want to check out my blog on Friday as there's something there for you. Good Morning. Just stopping by from the bloghop and thought I'd add my own congrats for the four thousand words. I once heard that the best thing to do when stuck is to either refill the creativity pot (go out and experience art in some form) or work on something else, a little different, to work through those tough times.